QUEZON CITY – A remarkable initiative of the Department of Interior and Local Government (DILG) under the new management of Secretary Jesse Robredo has enlisted the efforts of local chief executives as part of the process in finding a lasting solution to an age-old problem of corruption. We are all part of the problem so we should all be part of the solution as well – or so this first-ever step in a journey of a thousand miles to eradicate corrupt practices tried to say in simple terms. But the terms of engagement here are not simple, and it has yet to show if this endeavor makes waves. To be sure, many innovative approaches to lessen corruption in a country known as the only Christian nation in this part of the world, has already been done in the past, yet those moves were just like square pegs on round holes, as illegal acts to squeeze public funds went on, took many forms and faces, and carried out in seemingly legal maneuvers at that. What makes this one any different then? According to Feliciano Regis, the OIC-Office of Public Affairs at the DILG Central Office, this has been a novel approach to a lingering illness, even swearing that nothing like this comes close in previous administrations. This was also the very first pronouncement Sec. Robredo made shortly after assuming his new post, and he was a former Mayor himself, so he knows whereof he speaks about nuances in LGU operations. Not only that: the idea actually developed out of President Benigno Aquino’s inaugural speech on June 30, 2010 when he stressed the now familiar line “kung walang corrupt, walang mahirap,” Regis added in an interview at his office. That translates to an imposition for 80 provincial governors, 122 city mayors, 1,512 municipal mayors and, since October 2010, including 42,021 punong barangays to “faithfully comply with the provisions of laws and existing national policy” to inform the general public by posting “budgets, expenditures, contracts and loans in conspicuous places within public buildings in the locality, or in print media of community or general circulation and their websites” – all for a noble and lofty purpose of promoting good local governance. And, by extension, discouraging attempts of corruption, as the concerned, reading public would be duly aware and informed and, hopefully, these documents can serve as basis for spotting irregularities, then eventually to filing of cases, either in the Ombudsman or the Courts, if needed. Specifically, twelve (12) documents, with their corresponding information details, are mandatory to be let open, let known to a scrutinizing, often skeptical public purportedly to gain their trust and confidence. For posting this year, 2011, these are: CY 2011 Annual Budget, Quarterly Statement of Cash Flows, CY 2011 Statement of Receipts and Expenditures, CY 2011 Trust Fund (PDAF) Utilization; CY 2011 Special Education Fund Utilization, CY 2011 20% Component of the IRA Utilization, CY 2011 Gender and Development Fund Utilization, CY 2011 Statement of Debt Service, CY 2011 Annual Procurement Plan or Procurement List, Items to Bid, Bid Results on Civil Works, and Goods and Services, and Abstract of Bids as Calculated. Coincidentally, serving as a booster to the DILG-led direction, the 2011 General Appropriations Act, or RA 10147 that contained the National Budget for the current year, has a rider provision which makes full disclosure mandatory, reported Regis. He also pointed out that to sustain the initiative, DILG partnered with NGOs and civil society groups, in addition to their regional structures, for monitoring compliance both in form and substance, not just for the sake of compliance. By the end of 2010, those who had complied were not much – 18 out of 80 provinces, 34 out of 122 cities. But with NGO assistance, Regis was confident the figures would increase this year. But more than expecting a higher compliance rate, Regis said Sec. Robredo was particular on impact, on effects, if at all this has transformed the long-entrenched culture of corruption, replacing it with a culture of honesty which, in turn, will become a habit. A long shot, definitely, Regis humbly admits. But somehow there is hope. And hope, in the end, is something we have to cling to, like faith. Indeed, to turn an abstract concept into tangible, visible, and positive results requires a bottomless reserve of hope. Lots of it, actually, and discipline, too, especially the inner kind. 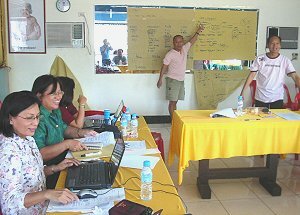 CATBALOGAN, Samar – On its first planning activity for 2011, Samar's newly launched anti-corruption group, MATA-Samar, has identified priority projects that have to be monitored. The meeting that took place last January 8 at its newly installed office laid down the plans and programs for the 1st quarter. In order to capacitate its members, the Multi-sectoral Alliance for Transparency and Accountability, will conduct trainings on the budget process, tracking and procurement. These skills will be very essential in the monitoring of the various infrastructure projects that are on-going and proposed for implementation in Samar. The group will invite resource speakers that will come from the Department of Budget and Management (DBM), Philippine Public Transparency and Reporting Project (PPTRP) and the Transparency and Accountability Network (TAN). The DBM will share in detail the regular processes that a budget has to undergo while the PPTRP and the TAN will equip the participants, knowledge on budget documentary reporting and paper trailing to ensure that irregularities and manipulations may be preempted. In an effort to equip the members with other skills necessary in addressing various aspects of corruption, Fr. Cesar Aculan of the Social Action Center, has been tasked to draft project proposals based on the training needs that were assessed in the same forum. The group will focus in the researching and gathering of documents relative to the on-going civil works that are being implemented by the provincial government. An estimated P274,106,000.00 worth of projects that are to be implemented in clusters and in lump sum appropriations are now made subjects for monitoring. The monitoring teams will dig into the programs of work, plans and specifications, contractor’s profile and the progress reports of each and every project. In this regard, MATA-Samar sent out letters to the members of the Sangguniang Panlalawigan of Samar, requesting copies of the above documents from the Provincial Engineering Office. At the same time, listings of the proposed projects, location, duration and its corresponding budget requirements have been posted at the MATA website and Facebook account for transparency purposes. The group further intends to furnish the local government units of the said lists for their own monitoring. MATA-Samar calls on residents to actively participate in the monitoring of projects in their respective localities. Hotlines will be disseminated for feedbacking purposes. It must be recalled that DILG Secretary Jesse Robredo has signed a Memorandum of Agreement with the Samar Island Partnership for Peace and Development (SIPPAD) during his visit to Samar, last September 2010. DILG expressed its commitment to fully support the anti-corruption efforts of the various civil society organizations. To this effect, directives have been disseminated to all Local Chief Executives to be transparent in their transactions and that public disclosures of all government procedures be a must. The order is also in line with President Noynoy Aquino’s national thrust for transparency and vision for a corrupt-free Philippines. It was further learned that MATA-Samar will conduct its protocol visits to the different Regional Offices for coordination by next week. The visit also expects to solicit support from the agency heads. Finally, MATA Samar expressed thanks to all other national anti-corruption organizations who have acknowledged the group’s efforts. “The successful launch held last December 10 is an indicator that it has the support from all other sectors. There’s no other way up, but to get united and continue the fight against corruption. Let’s all safeguard our resources”, a PPTRP official said. CATBALOGAN, Samar – They have different jobs, status in life, histories and most likely beliefs. But they all came together to express their common hope and goal: to help their province, said to be one of the richest in the country, to rise up and develop by demanding good leadership and management. The Multisectoral Alliance for Transparency and Accountability (MATA-Samar) was formally launched in this laid back city December 11 kicking off with an early morning motorcade followed by a forum that culminated in the signing of their Pledge of Commitment to Good Governance. As the name suggests, MATA-Samar is a motley mix of individuals and groups with varying interests but are bound to help their province improve its record on transparency and accountability. Members include journalists, priests, social workers, teachers, radio alert enthusiasts, environmentalists, farmers, and provincial government employees to name a few. Although anti-corruption initiatives are not new in the province of Samar, the opportunity to consolidate efforts came about middle of this year after several CSOs, media groups and government workers held an exploratory meet with the Philippine Public Transparency Reporting Project (PPTRP) to discuss ideas of a potential local transparency reporting group. The groups, which would later comprise what the MATA-Samar is now, discussed plans of forging links between media, CSOs and other sectors to increase understanding, monitoring and reporting of transparency and anti-corruption issues. First steps since its inception in September, MATA-Samar has so far spearheaded campaigns for better public access to provincial and municipal governments’ budgets and to monitor road projects. MATA-Samar members make a pledge of commitment to good governance, including divulging any anomaly that they learn. It has also taken part in the Millennium Challenge Account, a local monitoring counterpart that will take a major role in the implementation of the 222 km.-road network from Barangay Buray, Paranas Samar to Guian, Eastern Samar and the KALAHI-CIDSS project of the social welfare department. The project is part of the USD 434-million Millennium Challenge Corporation fund released by the U.S. foreign aid agency to address global poverty. As a requirement, beneficiaries should be committed to good governance, economic freedom and investments in their citizens. MATA-Samar has also taken part on different trainings, including that of understanding the national and local budgets, public journalism, and safety and security especially when investigating local corruption issues. MATA-Samar has also established its own website to make its campaigns more accessible and understandable to the ordinary citizens. Fr. Cesar Aculan, one of MATA-Samar’s advisers and director of Social Action Program of Diocese of Calbayog, said the group’s efforts would mean nothing if it fails to involve the ordinary peoples, that is why it is key to reach out to them and mobilize them. Around 60 people gathered at the launching forum. The participants wore shirts with the MATA-Samar logo and the phrase “Go go go, Samar!” in front and the logo of PPTRP website Pera Natin ‘To! and MATA-Samar’s website address at the back. PPTRP manager Rorie Fajardo, who joined the group for the event, congratulated the group for rising up amid risks of reprisal or retaliation from local officials frowning at anti-corruption groups.“Please help us deepen public understanding on public sector finance. It is only when the people understand the information they have on our national and local budgets that they are able to truly have a say on these. It is our money, so it is only right that our voices should be heard,” Fajardo said. The Transparency and Accountability Network (TAN) welcomed the formation of MATA-Samar. 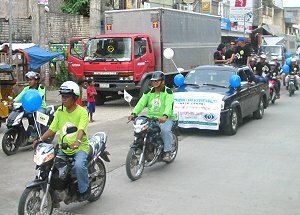 “…Time and again, citizens have proven that we are able to defeat the evils of corruption if we work together…We also congratulate the people of Samar for having a group like yours that has the courage to be at the forefront of the battle against corruption for the benefit of the community,” the group said in its message sent through email. The forum ended with the signing of the Pledge of Commitment to Good Governance. “I will not be part of any graft and corrupt practices and I will divulge any anomalous activity that will reach my knowledge,” says in the portion of the pledge. MATA-Samar members include the Social Action Center-Calbayog, Association of Concerned Employees in Samar (ACES), Tandaya Foundation, Samar News.com, and the Isog Han Samar Movement, SAGIP and the Philippine Public Transparency Reporting Project. CATBALOGAN, Samar – Samar’s anti-corruption group, Multi-sectoral Alliance for Transparency and Accountability (MATA-Samar), convened on October 9 at Tony’s Kitchen in Catbalogan for a whole day organizational structuring and workshop planning on the various activities that the group would undertake for this quarter. Despite holding the activity on a weekend, the session had at least 20 members from its core member-organizations participating actively in the workshop. The attendees came from the Samarnews.com, Alliance of Concerned Employees of Samar (ACES), Social Action Center (SAC), Tandaya, Isog han Samar, academe, group of volunteer lawyers and parish priests. In its visioning, the group identified a participatory democracy, responsive governance and an empowered citizenry as factors in achieving a progressive and peaceful Samar. It envisions Samar to be a livable community that is corruption-free and whose quality basic services would be accessible to everyone. Specifically, MATA would focus on the monitoring of infrastructure projects that are being implemented, engage on budget tracking and procurement and the delivery of social services. A feedback mechanism such as “Ulat ng Bayan”, scorecards and other accountability reporting tools will be facilitated to effectively monitor the performance of local government units. Efforts on establishing linkages with other agencies and networks are considered in its sustainability. At the same time, capacity building for all sectors will be undertaken to professionally develop and capacitate its members. These activities will be handled by the various working committees created directly under the supervision of an Executive Committee. Its respective functions and memberships were properly delineated on the same forum. The organization will be drafting its constitution and by-laws as a pre-requisite for its immediate registration at the Securities and Exchange Commission. MATA-Samar considers this imperative in seeking official representation in the different development councils in the locality. An official logo, distinctly representing the vision, missions and objectives of the anti-graft body will soon be publicly out. While a MATA website is waiting to be developed and maintained, Samarnons are encouraged to actively participate in the discussions and post related experiences and photos on a newly created “Facebook” account of MATA-Samar. Furthermore, updates of its activities are posted at Samarnews.com (online and print editions). Likewise, a weekly media forum will be initiated to engage local government officials and generate public feedback. “We are very happy that initiatives of this kind are being facilitated. Somehow, this will bring Samar to progress. A consolidated effort of the public sector and the civil society organizations is a means towards achieving fiscal accountability and transparency”, comments Mr. Dominador Cabanganan, President of the Samar Chamber of Commerce and Industry. MATA-Samar’s efforts are being reinforced by a Memorandum of Agreement signed for and between the Department of Interior and Local Government (DILG) and the Samar Island Partnership for Peace and Development (SIPPAD). It would be recalled that the said MOA was signed on September 22, 2010 by the DILG Sec. Jesse Robredo and the three (3) Bishops of Samar as representatives of the respective contracting parties. The MOA encourages CSO engagement in all government transactions for transparency and accountability purposes. In a related story, MATA-Samar has been officially recognized as a member of the Millennium Challenge Account, a local monitoring counterpart that will take a major role in the implementation of the 222 km. road network from Brgy. Buray, Paranas Samar to Guiuan, Eastern Samar and the KALAHI-CIDSS. The project is part of the $434 million Millennium Challenge Corporation fund released by the U.S. foreign aid agency to address global poverty. As a requirement, beneficiaries should be committed to good governance, economic freedom and investments in their citizens. As of press time, data gathering and documentation on infrastructure projects implemented by the provincial government are ongoing. A complete listing of all these projects is requested from the concerned offices for monitoring. At the same time, MATA is watching closely the preparation of the Provincial Annual Budget for 2011. MATA is in possession of an Office Memorandum signed by Governor Sharee Ann T. Tan requesting for all Chiefs of Offices to attend a Budget hearing on the 2011 Annual Budget Proposals at the Governor’s residence on October 7, 2010 t 4:00 pm. MATA believes that budget hearings are public transactions, thus, should be conducted openly and during office hours for transparency reasons. “The practice should be discouraged since this is not in accordance with the guidelines set. Budget hearings are participatory and the public has the right to be informed,” a MATA member asserts. CATBALOGAN, Samar – A new citizen’s initiative to promote greater transparency and accountability within local government has been launched in Samar with the help and support of the Philippine Public Transparency Reporting Project (PPTRP). 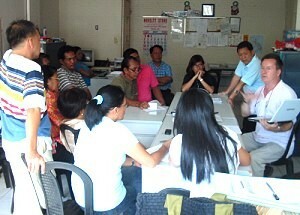 Following on from an initial meeting with PPTRP in May and two development and planning meetings held last month, an existing group of concerned people representing different sectors of the local community – and including local government employees in Catbalogan – have all got together and formalized themselves and their plans to promote and ensure participatory good governance in the province. The main objective of the newly-formed Multi-sector Alliance for Transparency and Accountability in Samar (MATA-Samar) is to promote greater awareness on anti-corruption, transparency and public accountability issues at the local level. The alliance, composed of media and civil society, aims to prevent misuse of public funds in the province through timely and factual reporting of public spending. Already, since the project idea was first discussed, the community is reporting greater awareness around public finance issues according to MATA-Samar conveners. The formation and launch of the initiative has already been widely covered in local newspapers and on www.samarnews.com. And a weekly public service radio program on DYMS-Catbalogan is now being hosted by MATA-Samar members. Participating media outlets are already proving to be a very effective vehicle for interaction with the local community and building greater awareness of the fact that a local organization now exists which is actively monitoring local public spending. MATA-Samar members are already attending weekly sessions and committee hearings of the Sangguniang Panlalawigan with session reports being disseminated in various media outlets. The group’s ability to access and get copies of the controversial Annual Investment Plan and the Annual Budget for 2010 of the province has made it easier for the opposition block to monitor, question, validate, stop disbursements and even petition the courts for an issuance of a Temporary Restraining Order in the implementation of specific Appropriation Ordinances. MATA-Samar is also now attending and observing selected court hearings and is providing moral support to the complainants of cases filed against involved provincial government officials. The group will have its formal launch before the month of September ends. Updates of the project and its activities will be published regularly on this website in the weeks and months ahead.